In 2013, siblings Kelly and Tyler McLean privately funded a brand new festival the duo named Splash House with hopes of bringing new life to their hometown of Palm Springs during what was thought to be a less desirable time of year for tourism in the area. Wanting to capitalize on the what he felt made Palm Springs stand apart from any other Southern California town and play to Palm Springs strengths to overcome the undeniable summer heat of the desert, Tyler McLean came up with the idea of throwing a laid-back, roaming, pool party with great music and a more relaxed vibe than the kinds of “fist bumping” pool parties nearby Las Vegas was known for. Despite some doubt the Palm Springs community ahead of the festival, McLean trusted the beauty of Palm Springs and went ahead with his pool party themed festival. “There’s no track record for an event like this, but the benefit of producing it in the private sector is, if it fails, it can be a lesson to the producer and no one else gets hurt.”Fessier, Bruce. The Desert Sun; 08 July 2013. 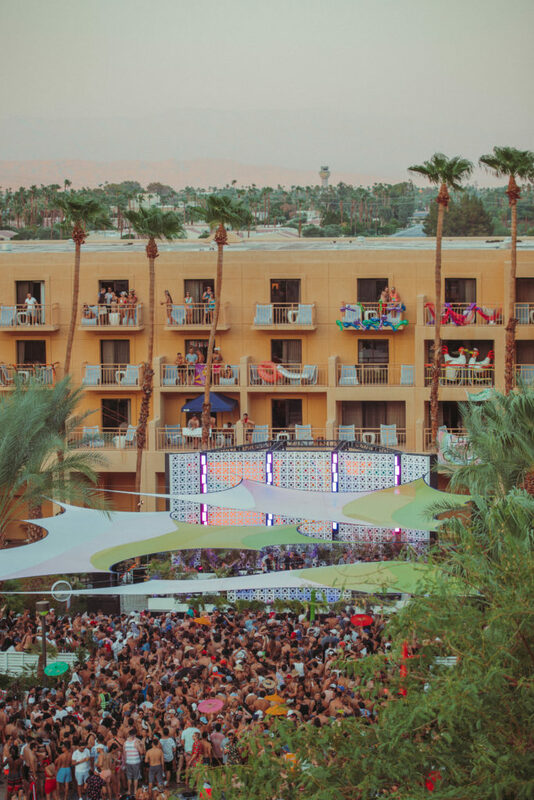 In August of 2013, around 1,000 festival-goers showed up to dance around the pools at the Saguaro Palm Springs, Caliente Tropics and The Curve Palm Springs Hotel and Resort to a relatively modest lineup of around 20 artists that included Kidnap Kid, Classixx, and Eats Everything. Just check out the promo video below from the very first Splash House for a cool throwback that highlights how much Splash House has grown in such a short time. There’s this feeling of carefree fun I think every music festival attempts (with varying success) to create and that is exactly what Splash House nailed from the get-go. Even more than the incredible lineup McLean curates year after year, I believe Splash House draws more and more people poolside yearly because it is one of the few festivals where everything is taken care of! No fuss, no muss, and only Piña Colada filled coconuts. All the usual festival stresses you secretly hate but put up with as “part of the experience” simply don’t exist at Splash House. Hot? Get in the Pool. Tired? Go upstairs or take a free shuttle with complimentary En water back to your room (which is never more than 15 minutes away) and take a disco nap. Have a deep-seated fear of melting porta potties from your last transformational festival? No worries. You are at a hotel filled with real bathrooms and actual sinks with running water meaning you’ll never have to resort to cleaning your hands with Vodka when the provided hand sanitizer inevitably runs out an hour into the festival. 2016 marks the only year the Splash House actually dropped down to two Hotels instead of three and was the first year I attended the festival. Despite deciding to go at the last minute, and attending the festival completely on my own, between Big Wild’s crazy/fun set at the Riviera and being able to see Justin Martin closer to the stage than I would have ever felt brave enough to get normally, I had an amazing time. To this day, the June edition of Splash House in 2016 remains my favorite festival that I have attended because it was the first time I truly felt like I was in charge of my happiness and that I wasn’t being held back from the same experience I saw everyone around me having by my social anxiety or extreme body consciousness (something I have dealt with since I was a child). And, even though it was sold out with around 5,000 people in attendance, I never felt crowded or like I was being pushed around. I remember being able to get in and out of the Riviera pool whenever I wanted and the Tiki Pool was practically empty! I remember loving all the crazy pool floats, including a champagne bottle that I falsely promised myself I would copy the next time around. It was a blast and I’ve been returning to the festival every year since. Sadly, despite being a pool party, Splash House now has size restraints on the pool floats they will allow. My plans for the ultimate cover image for my article were dashed when security wouldn’t let me bring the shark head pool float I had ordered just for Splash House in for even one photo. So be careful when bringing those Instagram worthy pool floats to Splash House. On the one hand, I understood there was little room in the pools left for large pool floats, but a fun Splash House pool float photo had been a goal of mine for years. And what’s the fun of a pool party if there’s no room to swim or play? 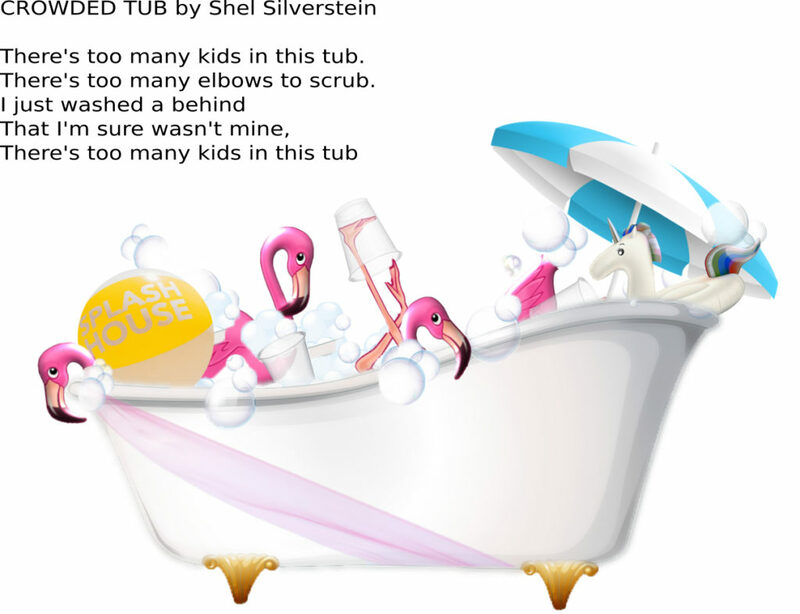 Every overly crowded pool I saw over the weekend made me think of a quirky Shel Silverstein poem that always made me laugh as a kid. I included here because it was thinking of this poem that made me kept my spirits up even in my crankiest moments of the weekend. In the 6 years and 10 festivals that have come and gone since the very first Splash House, it seems the festival has become a victim of its own success and the idea of an anti-Vegas, relaxed, and laid-back pool party environment has gotten pushed a bit to the side while the festival fights to keep up with its own popularity. Don’t get me wrong. I had a good time at Splash House and I would recommend the festival to anyone in Southern California who hasn’t had a chance to experience it. But, this was not my favorite Splash House experience. The lineup was amazing and I would have endured much worse conditions to see even half of the artists on the bill. My personal girl crush, Mija, got grimy and raw with a set at the Air Museum that had me holding onto the rail in the very front of the stage for probably the first time in my life. I usually prefer to stay tucked out of sight or way in the back of the crowd but something happened during that set and the music spelled me into full levitation mode and I simply floated to the front. 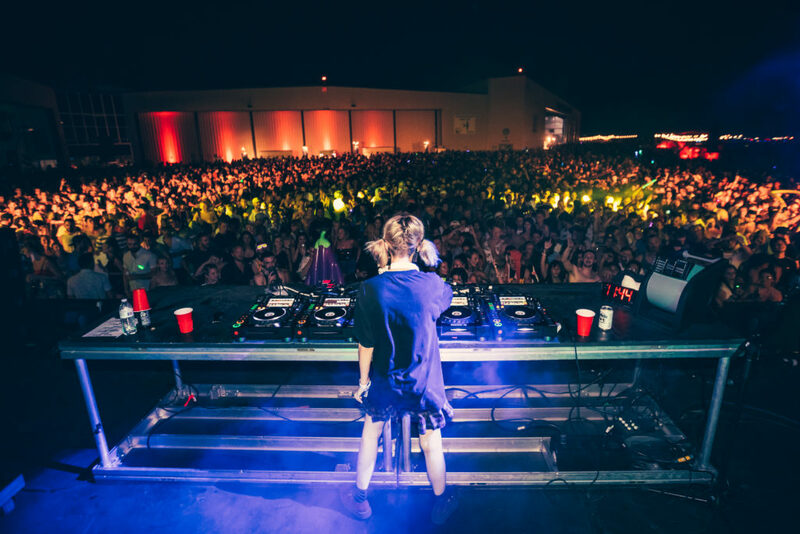 Then later when Dirtybird’s Fisher took the crowd on a ride with his popular song of the summer “Stop It,” I couldn’t help but feel like I wanted to stay on that roller coaster all night. Sunday, rather incredibly, had a lineup of DJs that I’ve listened to for years but for some reason had never had a chance to see live. For the first time in my Splash House history, I spent more time at the Renaissance than the other two hotels combined, with Latmun B2B Detlef, followed by Camelphat and a closing performance by Gorgon City. Sunday’s Renaissance lineup was an experience I wouldn’t change for the world. But the constant body to body crowd in the already hot weather of the weekend left me both uncomfortable and sunburned. All of the pools were so full of people when I did finally squeeze my way in I immediately missed a step, going completely under and getting a mouth full of water that was so salty that to keep from a panic attack I had to start mentally lying to myself harder than a kid telling their teacher the dog ate their missing homework! I was telling myself that the pool wasn’t salty because of all the sweaty bodies’ “electrolytes” I had just swallowed. It was a salt water pool. Right? NO?!? It’s okay. Alcohol is a strong disinfectant. With my usual safe place, the house haven OG Hotel “The Saguaro” (the only Hotel that has been a part of Splash House every year since it began in 2013) turning into an extra crowded hot mess, and not being allowed to bring in my pool float (whose shade would have prevented the nasty sunburn I’m nursing), I couldn’t help but feel a little deflated the first day. For me, this was the Splash House that proved more than ever that even with After Hours at the Air Museum, three hotels is no longer big enough for this Palm Springs summer staple. Both the June and August editions of Splash House in 2018 were sold to their 7,500 capacity. There needs to be at least one more hotel and in my opinion, double the amount of pool space. If only it was possible to have pools at the Air Museum as well!